Jim Devitt spent eight years working behind the scenes in a Major League clubhouse. After his time in professional baseball, Jim graduated from Washington State University in Pullman, Washington, with a Bachelor of Science degree in Zoology, and then continued on to complete his Master of Science degree in Education from the University of Miami in Coral Gables, Florida. He currently lives in Seattle, Washington with his wife Melissa and their son, Gavin. Q: How did you come up with the character, Van Stone? A: The character of Van Stone had been bouncing around in my head for a while. I wanted to introduce a main character that kids could relate to in a real world. With so much paranormal happening, I wanted to offer an alternative. I’ve read my share of Twilight and Harry Potter and like that genre, but I wanted to offer something that Young Adults could relate to in everyday life. Van is just that, a normal high school kid, not a superhero. The great thing about Van is watching him grow and develop. He deals with some pretty heavy stuff in this novel and it makes him better person. Q: Can you tell us a little about your character, Van Stone? Q: You spent eight years working behind the scenes in a Major League clubhouse, did this in any way influence your book? Or did you have the idea for the boo beforehand? A: I definitely came up with the idea about the book after working in baseball. The clubhouse environment is different from anything else in the world. It’s not a “locker room” like in sports growing up. Ballplayers spend over 100 days a year on the road and the clubhouse is really like their home away from home. In addition, the environment is very secluded. Only a few people across the country have access behind the scenes, dealing with these multi-million dollar athletes. I do want to mention that this is not a book about baseball. While I give readers a look behind-the-scenes, the baseball angle is just the setting for the story. The real story is the mystery that Van finds himself involved with and the growth he experiences dealing with the issues involved. Q: Jack stone, Van's father, how alike would you say the two characters are? A: I would say that the similarities between Van and his dad are minimal. Van’s dad is quiet, reserved, and pretty geeky. Van, while a bit shy, is more outgoing. In the end, Van may realize that he is a bit more like his dad than he thought, but you’ll have to determine that for yourself! Q: How does your family feel about you writing? A: My family loves that fact that I’m writing. My wife is probably more responsible for me following my dream of writing than anyone else. We were talking about writing and she said… Go do it! I’ve always written throughout my life, more for work than anything else. I’ve published research papers and even won a contest when I was young, but never set out to actually write a novel until now. It’s been tons of fun, but a lot of work. It’s become a big family project. My three year old son may not be as thrilled about me writing, it’s taken a bunch of time away from him and he sure is showing it lately! Q: What inspired the tittle for your book 'The Card'? A: The title of a book is the hardest thing to come up with, at least for me it was. There are so many ways to go with a title. In the end, we settled on The Card because it related directly to the opening scene of the book and the mystery that unfolds. Q: Who designed the cover for your book? And what inspired it? A: The cover came out better than I ever dreamed it would. The basic design concept was mine. The setting of the book is Seattle, Washington, and Safeco Field. The stadium plays a big role in the book so I wanted to have that in the background. There’s a little science twist to the book so it felt like it would be fun to put a formula on the sweet spot of the baseball. After talking it over with my wife, we searched everywhere to find someone who could do the artwork. Finally, Melissa sat down and did it herself! I couldn’t believe how great it came out. We then found a graphic designer through a friend that could put it all together for us. Marsha Rollinger did a fantastic job, if anyone is interested in using her services, just contact me and I’ll put you in touch with her. A: The hardest part of writing the book has nothing to do with writing. It’s all of the parts that come after the writing. Editing, revising, cover art, formatting, typesetting, editing, editing, did I mention editing? All that kind of stuff, it takes away from the writing time but completely necessary. I can’t wait to get back to what I truly love, writing. Q: Are you currently planing any future books, maybe another Van Stone Novel in the making? A: I definitely have plans for future books. I will continue the Van Stone series … I have plans for Van and his friends in the future, and I have already started the next book in the series. I am looking forward to writing other genre’s as well, but Van Stone is taking top priority right now. Q: Do you have anything specific you want to say to your future readers? A: I hope that you have as much fun reading the book as I had writing it. I always love to hear feedback, good and bad. 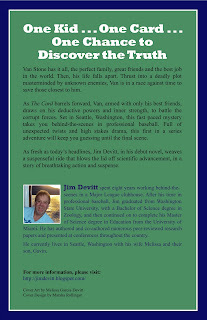 If you feel like you would want to comment after reading THE CARD feel free to contact me at http://jimdevitt.blogspot.com , I always strive to improve and your feedback will go a long ways to helping me do that. Thanks for the opportunity to connect with your fans in Author of the Week on your blog! Thank you, Jim for the awesome Q&A!! 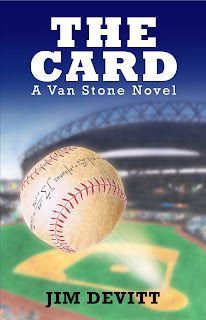 When Van wins an essay contest to become the new batboy for a major league baseball team, he finds himself in a foreign world of million dollar athletes and fame. Forced into the spotlight, Van is uncomfortable in his new role. His instant fame at South Seattle High School has turned all eyes toward him, including unknown adversaries that want something he has. Jack Stone works for Biotrust, a large and secretive biotechnology company. Van’s father is on the verge of making one of the most stunning discoveries in over a century, a technology that could change the world forever. While finishing the project, Biotrust forces Van’s father into a leave of absence. In an effort to protect his secrets, Jack may have endangered his family. As The Card barrels forward, Van slams headfirst into a plot that threatens the people near to him. Working through adversity, Van finds an inner strength. He draws on his deductive powers and an unstoppable attitude, to battle the corrupt forces. Not knowing who to trust, Van sets out with his two best friends to solve the secrets behind an innocent gift, a Moe Berg baseball card. Set in Seattle, Washington, this faced paced mystery takes you behind the scenes in professional baseball and into a world of cutting edge science and technology. Full of unexpected twists and high stakes drama, this first in a series adventure will keep you guessing until the final scene. As fresh as today’s headlines, Jim Devitt, in his debut novel, weaves a suspenseful ride that blows the lid off scientific advancement, in a story of breathtaking action and suspense.